We (Liz and Quincy Zikmund) took over ownership of Give a Dog a Bone in July of 2015. Wait, we can’t forget the pugs, Murphie and Otis. They basically run things around here. After years of shopping at and working for our favorite store, we simply couldn’t refuse the incredible opportunity to make Give a Dog a Bone an even bigger part of our life and family. Over the years we have learned a lot about pet nutrition and dealing with specific issues that dogs and cats may be dealing with. 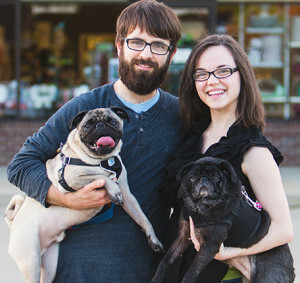 From years of helping customers find the right foods and solutions for their pets to caring for our own senior pug with more health issues than we can count, this became more than just than a just a job or set of life skills. For us, this can became a passion.